As with The Lavender Cure, my final product for this course, a mobile game about bees, presents research conducted during the latter half of the semester and provides an example for how to apply historical training and knowledge to a public history, video game format. The Buzz both serves to convey educational information about bees and provide a tool that can be utilized by Sustainability Studies at UNM, our food collaborative client. There are five main parts (badges to earn) within this game demo. The main feature is the ability to record bee sightings and bee-related incidents using a cloud-based Notebook. Players are encouraged to walk around UNM campus and if they see a bee (or wasp), record the sighting, adding any extra information (such as if anyone was stung). Once recorded, this note can be tagged and then is automatically placed on an in-game map that shows all of the notes that have ever been created — not just the player’s. This aspect was specifically requested by the Sustainability Studies Department to crowdsource such information, which can then be used to illustrate bee population on campus (regardless of the use of pesticides) and how many people are stung when in the presence of stinging insects. While sparse now, there is one note available on the map. The wasp icon on the left is a note about a wasp that got into Mesa Vista Hall, but did not sting anyone. A significant portion if the game centers around educating players about bees. There are three characters that the player can talk to — Beatrice, Nurse Paul, and Sage. Each one provides a different form of expertise on trying to challenge common misconceptions about bees and teach players about them in general. Beatrice discusses the difference between wasps and bees and how to tell them apart, Nurse Paul heals the player and talks about bee stings and how to tell if someone is allergic, and Sage provides a way for the player to learn about bee-friendly plants that can be planted or already are on campus. At its current iteration, these conversations are rather rudimentary and linear; engagement in the subject matter, admittedly, is likely to be lost due to long text descriptions without much application. In future development, these discussions will change, become more conversational and varied, and ultimately provide more potential for player choice in choosing what to learn about (and what path they wish to take in the game). This is Sage, an in-game character that provides a way to have players think and learn about bee-friendly plants. With more time and resources, I would also like to expand the game to include a character who discusses bee history in New Mexico and their historical significance to the Southwest. This feature, admittedly, will be the most challenging to convey. In The Lavender Cure, I experimented a bit with providing historical information and concepts about herbal medication and traditional healing in New Mexico, but my intentions ultimately fell short outside of providing basic, fact-based information with potential suggestions about the contemporary significance of such medicinal practices and their utilization in spite of access to more modern forms of medicine. 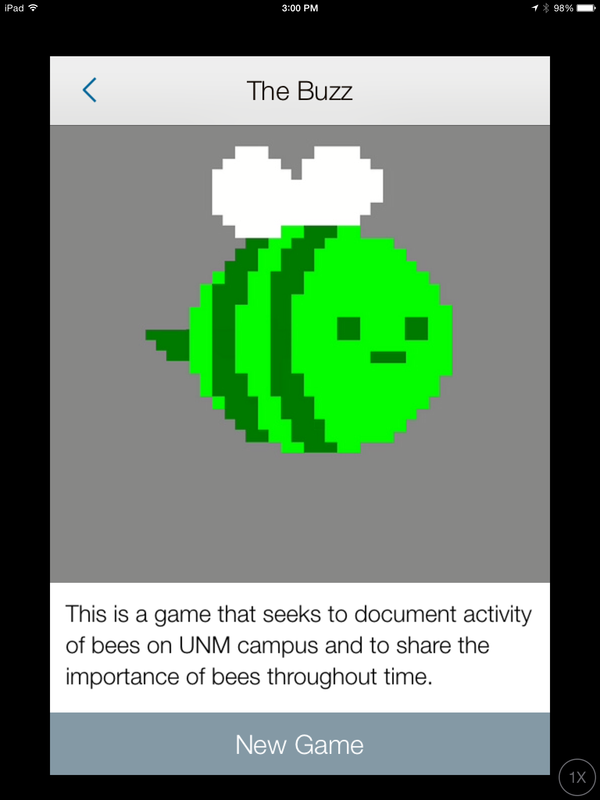 This game is a bit more challenging in presenting such information in this mobile game format, but there is potential to not only teach players about the historical significance of bees, but ask them to think like historians on their own, conduct research, and answer queries about bees and their role in New Mexico. The final feature of this game, and really the reason why I wanted to build it using the open source platform and GPS-based program of ARIS is its placement within UNM campus and its role as an augmented reality game. While the player can only place notes and talk to characters using an in-game interface, The Buzz is very much grounded on campus. 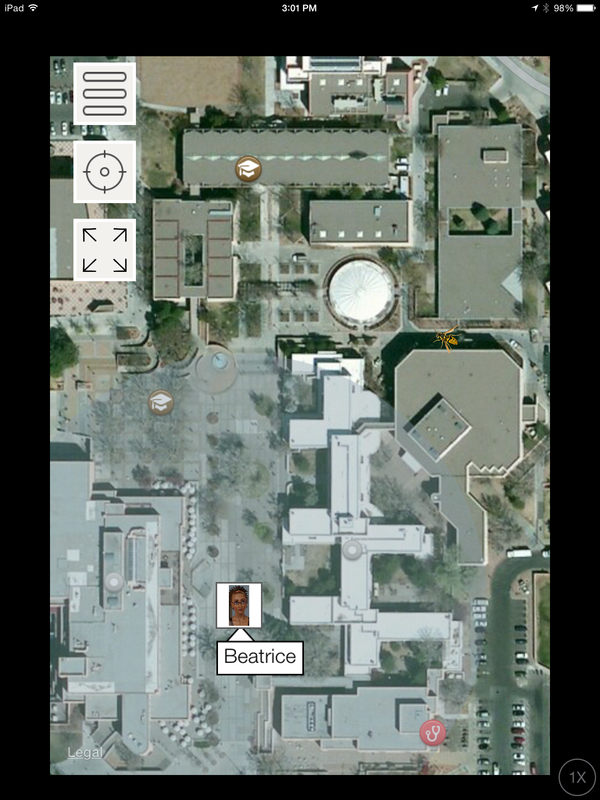 This is most apparent in the bee tracker/note feature, which aggregates bee-related notes onto a Google Map of the campus. Further, in order to play the game, players must be on campus and walk to certain locations in order to interact with the characters and items. 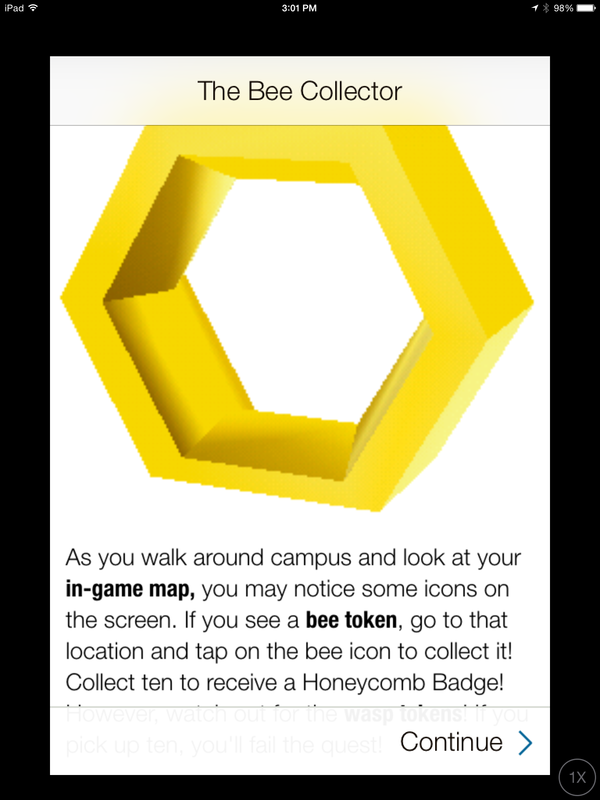 One quest actually asks the player to find bee icons (and differentiate them from wasp icons) placed on the digital map, walk to them, and collect them when they are within range. 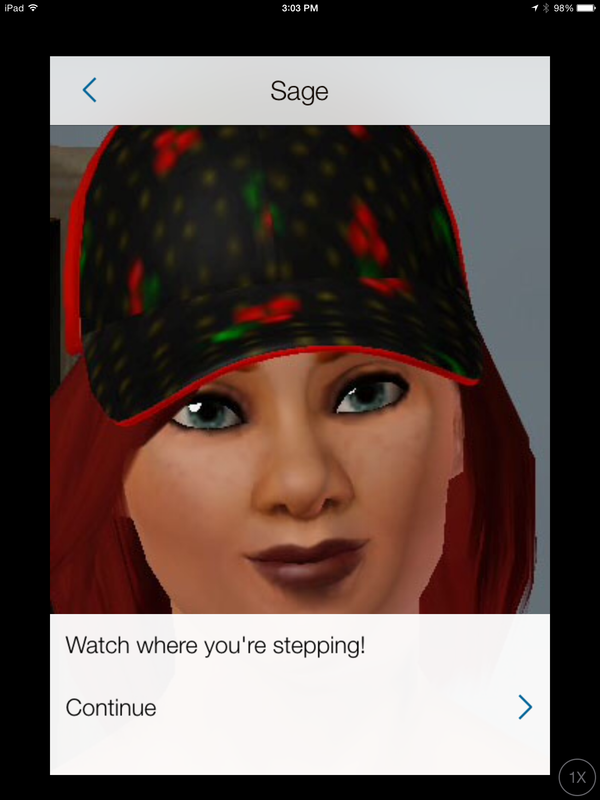 This feature blends the digital and physical worlds of the game and provides direct player connection with the information that is presented in-game and the campus that it is based in. This is the Quest Plaque that appears when the player has the option to collect bees which will spawn (appear) on the map at random intervals. The game is currently available to play. It is a demo and will need to go through many iterations and improvements before it, as a game, can be considered complete. Not only will original artwork have to be incorporated, more complex narratives, player options, and educational outcomes will need to be developed, most likely under a larger team of developers and educators. Further, because the program I used, ARIS, is freshly out of beta for its 2.0 version, there are some bugs that still need to be worked through. Unfortunately, some of the dialogue does not always appear when it should and ultimately locks the player out of progressing through the options and completing one of the five quests. This issue will need to be fixed in later versions as the software becomes a bit more reliable, the dialogue becomes more refined, and I become more familiar with the new interface of ARIS 2.0. To play the game, download the ARIS app on the Apple Store (unfortunately, this is only available for Apple products). Create an account in ARIS and then search for “The Buzz.” The game that appears should have an icon of a green, pixellated bee. You will need a reliable internet connection to play. If there are any bugs (no pun intended), you can notify me at GMayARIS@gmail.com. In a recent profile for Huffington Post’s “Style” section, female folk rock duo Kemp & Eden shared their thoughts on their personal fashion sense and artistic endeavors. While ruminating on the state of what’s cool and unique among young creatives today, member Charlotte Kemp–who is also a model and the girlfriend of Beatle scion Sean Lennon–makes the statement, “Everybody’s got a band, everyone’s a filmmaker, but once you sift through all the white noise there’s just a few people really doing something interesting. I think of it actually being cooler and more relevant and way more edgy just to become a farmer.” Embedded in this musing by a waifish New York scenester is the growing perception among millenials that farming is fashionable. As outlined in my previous blog post, The Foodsters, this generational opinion is informed just as much from current trends in hipster artisan culture, DIY sensibilities, and food-related media, as it is from environmental activism, health concerns, family history, or economic security. While eating local, slow, and sustainable foods has become popular amongst individuals in every demographic, millenials have especially embraced the “conspicuousness” of food production and consumption. They are growing their own food, spending Saturdays at the farmers market, pickling their organic produce, and documenting it all on social media. As an educational garden aimed primarily at college-age students, Flagship Farms has the opportunity to capitalize on this cultural moment to reach and recruit a wider population of young people than are typically interested in agriculture. Outreach is critical because the median age of farmers in the United States is 56-58, with a large portion of Baby Boomers now reaching retirement age. To compound this problem, fewer of those farmers’ children are continuing in the family profession. 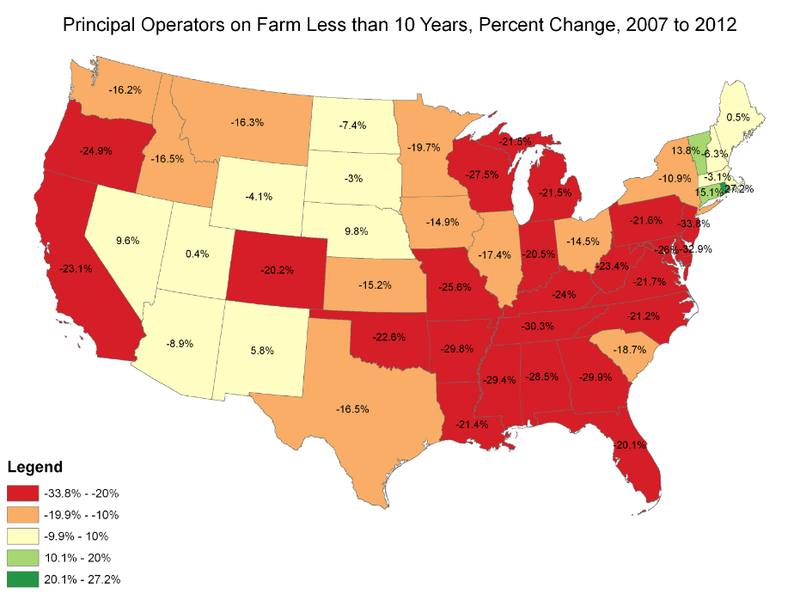 Census statistics from 2012 show a 23 percent loss of 35-44 year old farmers since 2007, likely due to the Recession and weather affected by climate change. it is critical that a new generation of farmers, even those with no backgrounds in agriculture, take up the mantle. For Flagship Farms, perhaps the hope is that while many will join because of it’s trendiness, the program might ingrain the deeper values of sustainable agriculture, and therefore enable a larger retention of farmers and local food makers after trends inevitably shift. 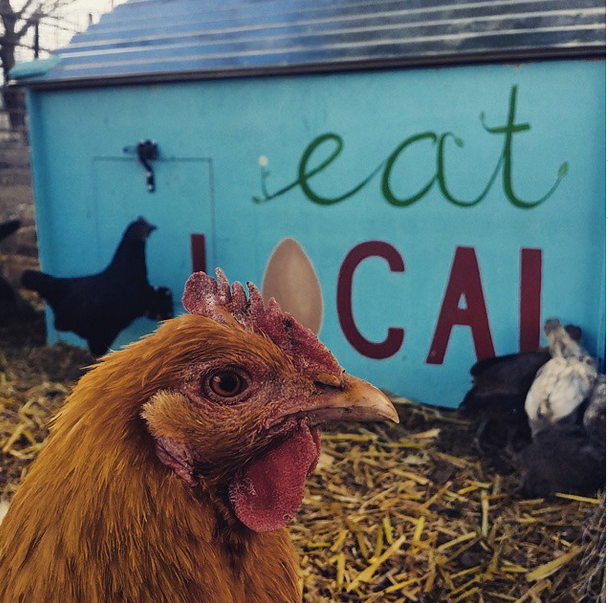 (Urban animal shelters have already been inundated with backyard chickens by fair-weather “hipster farmers.”) But in order to get college kids committed to local and sustainable food production, they have to get excited about the program. Avenues for outreach include social media, savvy branding, and foodie-centric collaborations. The advantages of advertising and interacting with young people through social media cannot be overstated. While many farms have a rarely updated website, or even semi-active facebook page, the center of internet farm culture resides on instagram. As the fastest growing social media platform, instagram has become especially integral to small businesses promoting a lifestyle brand. Unlike Pinterest which simply shares images of products, businesses with successful instagram accounts post imagery meant to evoke the essence of a company/restaurant/clothing line. For something as visually rich as a farm, this is a no brainer. 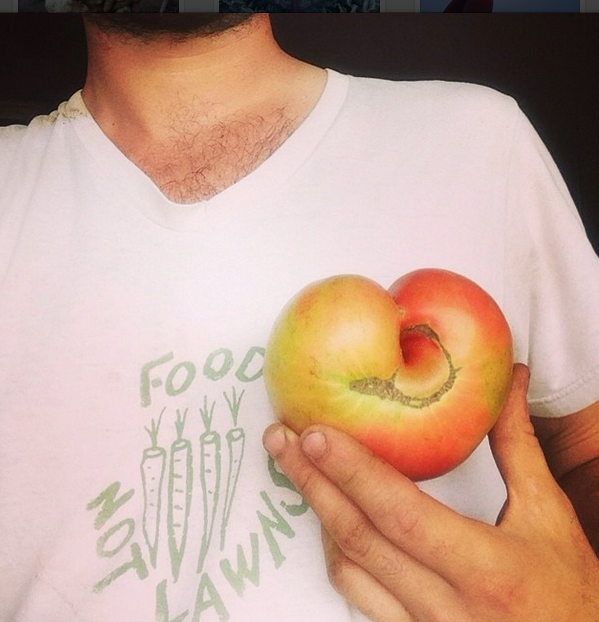 For Albuquerque farmer Seth Matlick, 31, of Vida Verde Farm instagram means more than free advertising. “We have followers from all over the world. It allows me to connect with fellow farmers, we support each other. Looking at other farm’s photos is inspiring to me. I get new ideas for tools and crops, and having so much positive feedback is gratifying and pushes me to do better.” For Flagship Farm the branding can extend beyond pretty images of produce and flowers to incorporate scenes that invoke college life, education, activism, healthy living, and New Mexican culture. This is a great recruitment tool not only for fellow lobos, but for potential students thinking of attending UNM from around the country. 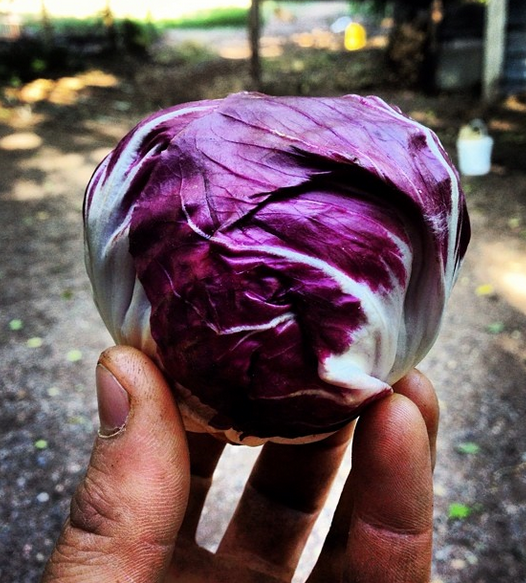 Other colleges have lovely campus farms, but have neglected their social media presence. Flagship Farm could generate a lot of publicity just by filling that niche. Students in the program should have access to the account to share their own pictures. This will allow them to share their successes with family and friends and further instill a sense of pride in what the are doing. Social media will also allow the community to see on a regular basis what is coming out of the field, and where they can buy it. Of course it is not enough just to grow the food. If Flagship Farms wants to train students to be farmers not hobby gardeners, the students should also participate in selling their produce. Farming is a business, and a difficult one at that. While philanthropic endeavors such as donating vegetables to local charities or giving fellow students access to fresh produce are great ideas, Flagship Farms should also encourage students to sell their goods for profit. 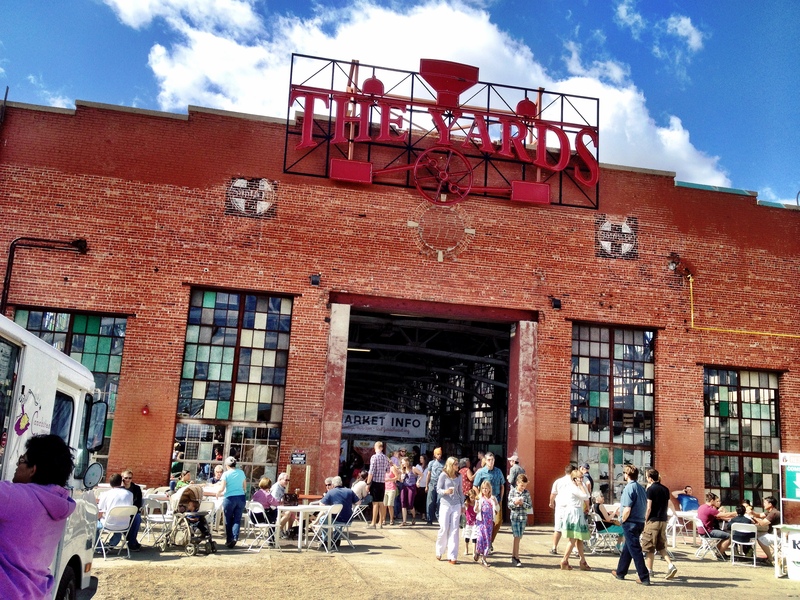 Perhaps this means selling to local grocery stores or restaurants, but in terms of speaking to this generation of foodies and conspicuous consumers, selling at the Rail Yards market and to gourmet food trucks may be more “on brand.” The Albuquerque Rail Yards market will allow students to interact with the public and their peers, gain skills in salesmanship and merchandising, and participate in a weekly event aimed at revitalizing the city. Selling or collaborating with some of the 100 local food truck vendors exposes Flagship Farm produce to a large population of local consumers, lets Flagship farmers participate in the growing artisan and gourmet local food movement, and allows students to reap the rewards of their bounty by eating deliciously prepared food in places they frequent anyways–local breweries. According to the New York Times, “The food movement — led by celebrity chefs, advocacy journalists, students and NGOs — is missing, ironically, the perspective of the people doing the actual work of growing food. Their platform has been largely based on how to provide good, healthy food, while it has ignored the core economic inequities and contradictions embedded in our food system.” This is where Flagship Farms will intervene. Once the program has inspired a legion of bright-eyed youths to partake in the “food revolution,” it can begin to teach potential farmers about land acquisition, start up costs, political lobbying, labor issues, environmental best practices, and production and marketing skills. Once they are informed and prepared for the long hard road ahead, the program’s focus should move on to retention. To do this Flagship Farms would benefit from relationships with local farms on a variety of scales, practicing a variety of methods, and whose farmers are willing to talk about the financial and physical tolls of farming as well as the rewards. Farming is not as glamorous as milenials think it is, but Flagship Farms can appeal to those ideals in order to get young people in the field. Only then can the program better educate them so that they may make informed decisions, become better businesspeople and, hopefully, passionate food activists. It’s about time to talk about the bigger picture. School lunches form an integral part of a vast governmental ecosystem; they support nutritional, anti-poverty, and developmental objectives while also ensuring funds recycle themselves back into U.S. agribusiness. Throughout it’s existence, the school lunch has remained among the most popular of social welfare programs—the reality is that children are everyone’s responsibility, so they are “appropriate” targets for federal, state, and local assistance. However, the history of these programs in New Mexico, and Albuquerque more specifically, reveals the limitation of school lunch policy and practice as it pertains to traditionally underserved communities. Aside from the beginnings of school lunch, where the PTA and volunteers cooked their own recipes, served their own children, and lugged food to schools themselves, the lunch contents themselves often remain mired in a midcentury Anglo-American cookbook. New Mexico’s unique foodways were repeatedly undercut in this subtle way, and although green chile stew might exist as a Friday special, the foods fed to students in New Mexico often bore little resemblance to the foods they ate at home. Cultural appropriateness was not, until recently, even part of the discussion surrounding school lunches; this testifies to the power of dietetic discourses that discounted local food knowledge—children in Albuquerque were eating canned spinach when they could have eaten quelites. Secondly, the rural and poor character of this state created particular challenges, which remain entrenched in one way or another. Schools in rural areas struggled to adequately feed their students, and had limited local options available when purchasing foodstuffs. When the bounty was good, they got commodity meat and cheese alongside bulk flour and butter, but in a pinch the USDA would cut back their expenses and leave the check with the states, who saved money by buying questionable hamburger meat. What tended to occur instead was a homogenized, repetitive meal plan consisting of whatever commodities could be procured in bulk by the USDA. The state’s poverty also stretched its lunch program budget to the limit. Repeatedly throughout the 20th century, the state raised prices, covertly denied free or reduced lunches, and otherwise slashed costs in their attempt to keep serving lunches. At the same time, subjected to top-down federal policies, New Mexico found itself in conflict. For instance, in order to keep providing free lunches to Native American students, the state sued the federal government over its homogeneous guidelines. Even though my research emphasizes the 1940s through the 1970s, we are not past these problems. Luckily, school lunches are in the middle of a resurgence. They are analyzed by researchers, policy makers, parents, nonprofits, the first lady, and others interested in the welfare and health of our children. There has perhaps never been a greater opportunity to make an impact on the content of school lunches, despite the struggles over the school lunch standards in Congress this past winter. What remains lacking in these new conversations is a foundation in the history of NM school lunches, local agriculture, and culturally-relevant foodways. The history tells us what mistakes have been made (in some cases repeatedly) and suggests that major change requires we think critically about these lunches as parts of a massive agricultural infrastructure. I think that the UNM Flagship Farm offers an opportunity to teach to my concerns. I understand that the plan is to utilize it as an experimental and educational resource, emphasizing the process of growing and the knowledge behind food over productive capacity. This, I think, is admirable. My hope is that the Flagship Farm can partner with local schools (not just students, but also cafeteria staff and teachers) to tour the gardens and offer gardening lessons, as other nonprofits such as the Food Corps are already doing in New Mexico schools. I also understand that the farm is committed to demonstrating organic and sustainable agriculture—typically these goals conflict with the tenets of school lunch programs (feed as many children as cheaply as possible) but they needn’t be opposites here. I think history helps synthesize these strands; students using the farm could use my research on historical meal plans to think about what alternative meals would meet nutritional requirements and budget restrictions while sourcing food locally and sustainably. Finally, I think getting students engaged is an important path in modifying the current school lunch system and nutritional failings of American culture; as we experience a food renaissance we can use that enthusiasm to get kids interested in what they eat and how it grows. It’s hard to tear children away from the simple sugars and fats lurking within most snacks (and within schools themselves, when they have vending machines or nearby fast-food joints), but it is a task worth doing. I hope to offer my research in whatever format assists Sustainability Studies the most, and I am happy to be of whatever other help I can provide. As another semester wraps up at UNM with final papers and presentations due for undergrad and graduate students alike, in our AHA Mellon Field Course we do not have the simple luxury of a final product. In my own line of research with seed libraries, I have found out that seed exchange might be a solution for libraries seeking community engagement and small backyard gardeners interested in using open source seeds. Yet how this rather present day condition of seed saving reflects upon New Mexican food history has confounded me. I have tried to delve into the New Mexico seed law but I did not care about the legal conditions for seed labeling because I did not make patented seeds a part of my original research project. I then took a turn towards the non-profit organizations like Native Seed/S.E.A.R.C.H. and The Chile Institute to see if the foundations of their southwest seed saving came from a particular zeitgeist, but that too was fruitless. So I’ve decided that with what I have researched that the best seeds of the future should be education to connect New Mexicans with their food system through a traveling seed exhibition. This idea comes from my Museum Studies background which influences a great deal of my project planning. I like to think about my subject as a theme for an exhibition in a museum and what could come from either a permanent installation or an educational traveling exhibition. In the case of seeds I believe an exhibition that could travel across the state would be interesting because it could inspire communities without seeds libraries to organize their own. If it were to have a home, the New Mexico Farm and Ranch Heritage Museum would be a good institute to house it permanently. The information included in the exhibition would be concerned with seed heritage in the southwest; the open source value of heirloom seeds versus patented seeds for the small scale farmer and backyard gardener; the multiple non-profits who promote seed saving; and finally the history of seed libraries. This information would be interpreted through objects like seed packets, seed maps, pictures of planting seeds, and hopefully the collaboration of the PBS show Food Forward TV which did an episode entitled, “Seeds of Change” featuring a seed library in Tuscon, Arizona (see http://www.pbs.org/food/features/food-forward-season-1-seeds-of-change/). Since New Mexico does have a seed library, perhaps even an interview conducted with seed librarian Brita Sauer could be featured. Another partner for this exhibition is SeedBroadcast, a New Mexico based project interested in recording seed stories from across the country. The Mobile Seed Story Broadcasting Station is currently visiting Tuscon, Arizona for the upcoming International Seed Library Forum on May 3rd – 6th. The collection of oral histories about seeds would add to the traveling exhibition because it connects seed stories to listeners who might not understand that seeds do have stories. My hope is for the seed exhibition to have connections with food history via modernity, tradition, and leisure versus work as interpretative tools. At the end of this seminar, I do not know if my project has been historically research based. I took my interest in seed libraries on a journey into what community libraries can do for the seeds of the future, and did not pay much attention to the seeds of the past. Perhaps this says something about where I am going in my own studies as a graduate student, but hopefully in my blogs I have shown that I have learn and wish to teach others about the importance of seeds for the food we continue to grow and consume in larger portions across a planet struggling with global weirding. The smell hits you as soon as you turn from 2nd street on to Marble Ave.: sweet and tangy barbecue pork infused with a delectable blend of apple, oak, and hickory woodsmoke emanating out of a no-frills 1961 silver food truck. “Wood is a spice,” explains Artisan Valley Smokehouse pit-master Ben Gonzales, “we choose our firewoods for their flavor, and we roast our meat low and slow.” Slow is the operative word to describe the process AVS uses to prepare their increasingly popular “Whole Hog” Saturday meal at Marble Brewery. Co-owners Gonzales and Gilbert Aragon–who is also the executive chef at Hotel Albuquerque–begin every Whole Hog Saturday on Monday morning. Aragon begins by shaving the hide and cleaning the silver skin off of a locally raised Kyzer Farm hog. Next he brines the pig in a sugar, vinegar mixture combined with ingredients from that week’s particular flavor profile, such as Hawaiian lemongrass and Kahlua, or local stouts. After the meat marinates for thirty-six hours, Chef Aragon applies a custom rub to the skin and lets it cure for twenty-four hours. On Friday morning, Aragon hands over the savory swine over to Gonzales who carefully smokes the meat; adding fresh wood every three hours, for over twenty-four hours, until it has been roasted to juicy, fall-off-the-bone perfection. 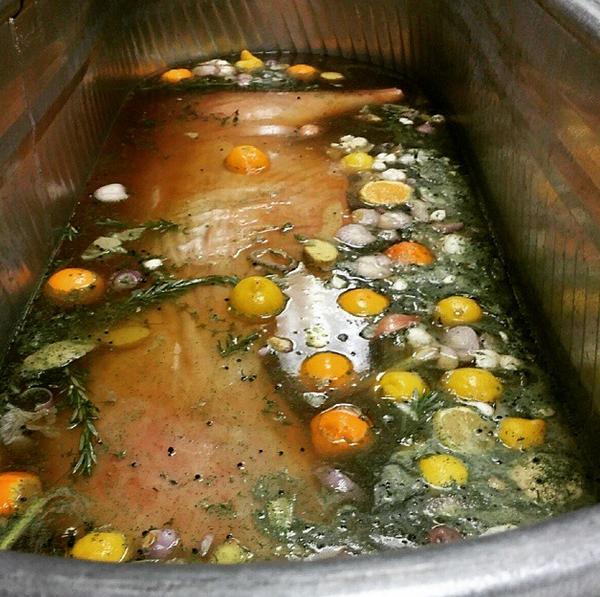 It is evident from their Whole Hog Saturday menu that AVS is dedicated to local and artisan-made ingredients. On any given weekend the pork may be paired with “brew bread” baked with La Cumbre’s “Slice of Hefen” beer yeast, handmade pickles, apple-smoked cheddar, local kale-slaw, or New Mexican favorites like caramelized green chile and chicharones. While AVS is not the first food truck in town offering fresh local ingredients and artisan street food, they are striving to separate themselves from the peripatetic pack by becoming a more self-contained sustainable operation who grows their own produce, eggs, and honey. 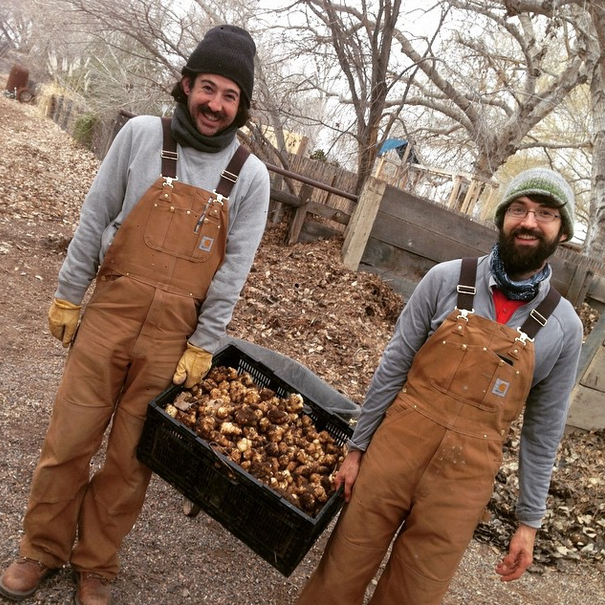 The ambitious duo originally conceived of a farm-to-truck business supported by an urban microfarm. But their hog supplier “Mr. Kyzer” (as they respectfully refer to Robert Kyzer of Kyzer Farm) convinced them to “think big, be big,” and offered AVS two acres on his property in the far South Valley. For the last six months Aragon, Gonzales, and their families and friends have prepped and planted the soil. They enlisted local chicken outfit Renegade Poultry to construct a Zia decorated chicken coop. And they built relationships with local restaurants and breweries to buy their food and collaborate on special meal events. 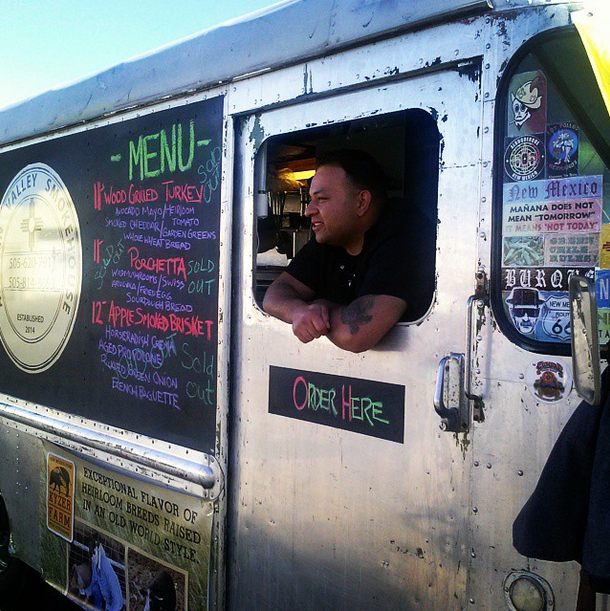 Mexican street food has long been a mainstay of the Albuquerque foodscape–Gonzales’ grandmother even owned a taco truck!–but the gourmet/artisan food truck scene has really only taken off over the last three or four years. There are now about one hundred locally operated trucks. 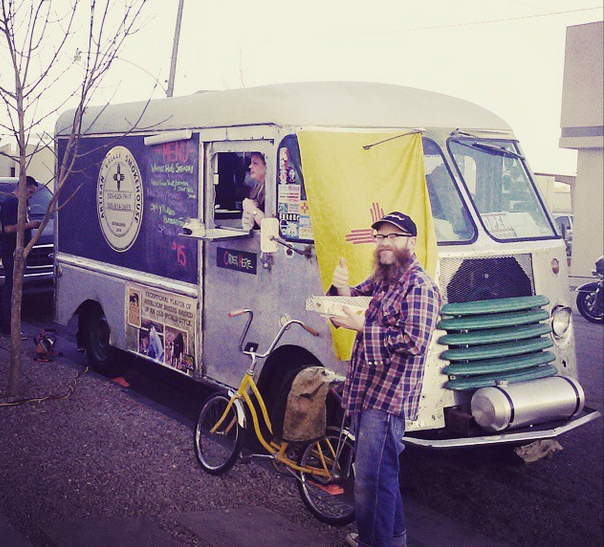 Albuquerque’s ever-growing brewery scene has greatly contributed to the spike in mobile eateries by allowing them to park pubside. The situation has been mutually beneficial as most brew pubs have a limited to nonexistent food menu. Community support for these roving restaurants has taken shape in various forms, from the recent “Great New Mexico Food Truck and Craft Brew Festival” at Balloon Fiesta Park to UNM’s “Food for Thought” fundraisers to Mayor Richard Berry’s “Truckin’ Tuesdays” initiative which allows food trucks to set up for lunch in Civic Plaza every Tuesday. Not everyone, however, is thrilled with the roach coach renaissance. Brick-and-mortar restaurants in Nob Hill and Downtown have complained that trucks take away from their businesses, and many support a proposed local ordinance that would prohibit trucks and food carts from setting up within 100 feet of a restaurant. It’s easy to understand how stationary establishments may feel threatened when local trucks roll up offering up affordable specialties such as Oak Smoked Meatballs, Korean short-rib lettuce wraps, and Maine lobster rolls. The AVS truck parked outside of Marble Brewery and a satisfied customer. 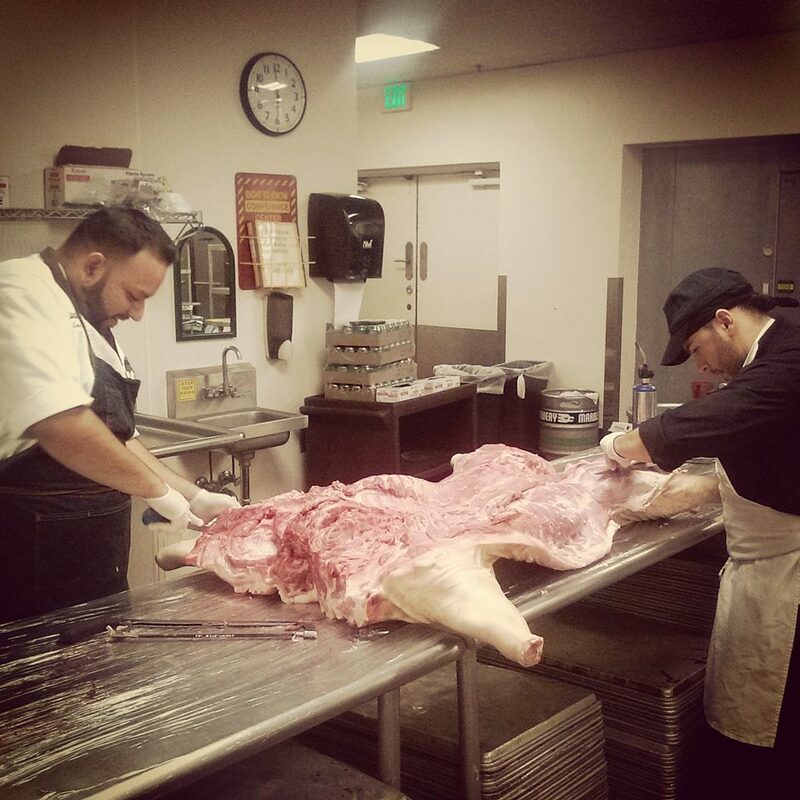 *photos courtesy of Artisan Valley Smokehouse, see more on their facebook and instagram accounts. A recurring theme throughout this course seems to focus on dispelling the myths surrounding food and food production, especially the myth of the yeoman farmer. Farming should not be treated as a hobby, and those interested in becoming involved should expect it to be hard work and, at its core, a business venture. Far too often is the role of farmer romanticized, overshading the true intensive labor and business acumen required to succeed.This discussion is better covered in other colleague’s work, but I feel that this idea can also be applied to my research in herbal medication. Reliance or use of herbal medicine has been fairly romanticized. It’s often described as “healthier” and more natural than pharmaceutically created medication by those who ardently believe in its use, and such remedies are usually paired alongside displays of other nontraditional medicine, often emphasizing meditation and spiritual healing. There is some truth to the benefits of herbal medication and its spiritual uses. Again, the Fabiola Cabeza de Baca papers housed at the Center for Southwest Research feature a discussion of these herbal remedies. Fabiola emphasizes the need for faith in their curative powers; a spiritual element is crucial. But, these herbs were not just for spiritual healing. Fabiola’s discussion of plants and their properties includes descriptions of these herbs and what ailments they can medically cure based on their vitamin and medical properties. While nontraditional, these herbal remedies do have a scientific base in their use. The Maclovia B. Zamora papers illustrate a similar backing for earnest medical properties of herbs. These papers discuss the B. Ruppe Drug Store, a yerba store that sold herbs and standard medication in downtown Albuquerque. Like our assertions against the yeoman farmer, this store de-romanticizes the use of herbal medication. Many of its patrons do use these medications as a continuation of traditional and Spanish and Indigenous culture, but the fact that the B. Ruppe Drug store stocked herbs from around the globe is significant. Herbal medication is not restricted to what you can find in your backyard or on a hike (especially if you are unfamiliar with this practice, it’s highly not recommended). Further, its use is not just something based on traditional practices and stuck in the past. Herbal medication is dynamic and changing; as users and scientists grow to understand what medical properties are contained in certain plants and how these herbs can be applied to illness, so do our uses of them. This is best demonstrated in a recipe-like box within the Maclovia collection. Herbs were written on individual index cards alphabetically, with their medical properties, preparation, and country of origin included. In addition to New Mexico local herbs, the collection featured herbs from around the country and around the globe. One plant, Blessed Thistle (Cardo Santo), originates from Europe, but can be used in New Mexico as a contraceptive or to cure fevers. Importantly, another myth contained in the use of herbal medication is that the user is not aware or does have access to modern medicine. To some degree, this can be true, especially if the user does not have access to a doctor due monetary, insurance, or location issues. But, people who use herbal medication can also have access to standard medication and either opt to use these yerbas in lieu of or in conjunction with general medicine. Maclovia herself used herbal medication to reduce her high blood pressure. She did have access to standard medication, but its use affected her respiratory system, so she “went off it and took herbs, and [her] blood pressure is much lower.” (Tri-County Advertiser, July 1, 1992) The medical properties and makeup featured in standard medication mirrors that of herbal medication (if anything, it is a concentrated version). Using herbal medication is no different than switching the brand of a particular medication because the previous one gave you adverse side effects. These arguments are important to illustrate the legitimate, scientific benefits herbal medication can have and further debunks misconceptions about herbal remedies. In New Mexico, I would argue that their use does connect to a cultural and traditional practice, and there is a spiritual element that is absent from standard medication. However, these facts do not discount the use of these herbs as medical and curative. Further, use of herbal medication is not a practice static in the past, nor is it something only practiced by new age hippies. The B. Ruppe Drug Store is testament to this. It was in operation from 1883 to 2011 and served as a community asset, catering to a wide range of people in the community, and only closed when the owner at the time was ready to retire. It perpetuated a nostalgic idea of the past, continued traditional uses of herbal medicine, but it also operated in the present as a successful business founded upon the medical (scientific) properties of herbs and how these properties could be used heal. This is the draft script for part two of my planned podcast series. For more information on that project, please see my previous post. Cadete, chief of the Mescalero Apaches, and about five hundred of his people backed their way into Dog Canyon. It was October 1862. A regiment of California Volunteers fought them into that gorge that led all the way from the high Sierra Blanca Mountains, down to the white sand deserts of southern New Mexico. Following General Carleton’s orders, the military had been chasing the Mescaleros for some time. “All Indian men of that tribe are to be killed whenever and wherever you can find them,” he commanded. The Apaches were fighting back though, as they had always done. From crevices and behind boulders, they defended themselves as well as the canyon would allow. They used bows and arrows mostly. They had guns too, but little ammunition. However, they were growing weary of the fight. They were hungry. 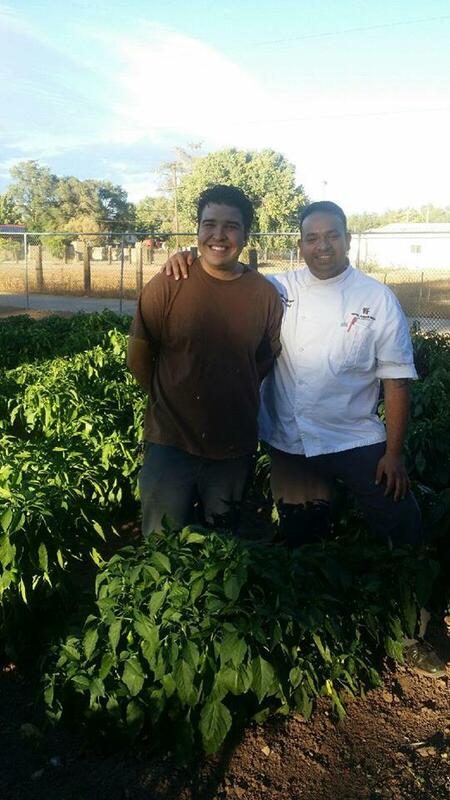 Recollections of the Native experience at Bosque Redondo keep coming back to food. “That place at Fort Sumner was what is now called a concentration camp,” Big Mouth explained. “There was nothing there for us except misery and hunger.” Carleton claimed he would create a reservation with a self-supporting food system based on agrarianism. But, the forced farming did not work because of poor land, foul water, and insatiable insects. It was fine with Carleton – just a minor setback. The government would have to feed the captives for the time being. He expected the next year to be better. Early Spanish explorers named the Mescaleros after the mescal, or agave cactus, that was their staple food, especially during the summer harvests. They also gathered yucca fruit, juniper and sumac berries, nuts, seeds, and hunted wild game before their capture. Agave, though, was most important to them. Mescalero women harvested the roots of the plant with heavy tools while men stood guard. Then they steamed the hearts in fire pits dug into the earth for half a day or more until they were tender and syrupy. Drying any leftovers for eating or trading later allowed for future sustenance and created an economic instrument well after the harvest. Even the fibers of the plant were valuable as thread for weaving. But, agave did not grow on the plains. 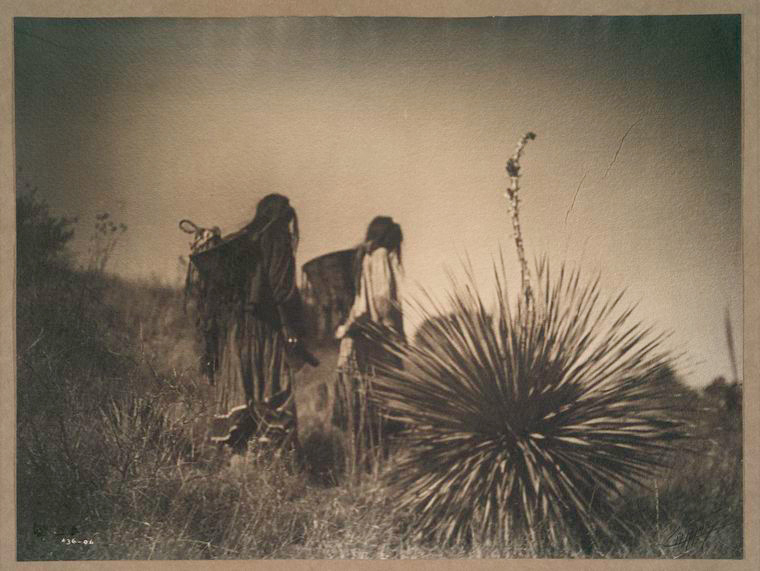 The Apache’s captivity at Bosque Redondo separated them from their native foodways and they were getting hungrier. By late spring 1863, it was clear that the government rations of flour, coffee, and bacon were not coming in fast enough. The Mescaleros were given permission to go out on a hunt to supplement their provisions – a forty-eight hour leave. Ninety warriors and fifteen women went out onto the plains – the warriors only armed with bows and arrows. They spread out in a line more than half a mile wide and combed the prairie, eventually encountering an antelope heard. The ends of the line swooped around and encircled the animals resulting in eighty-seven kills. 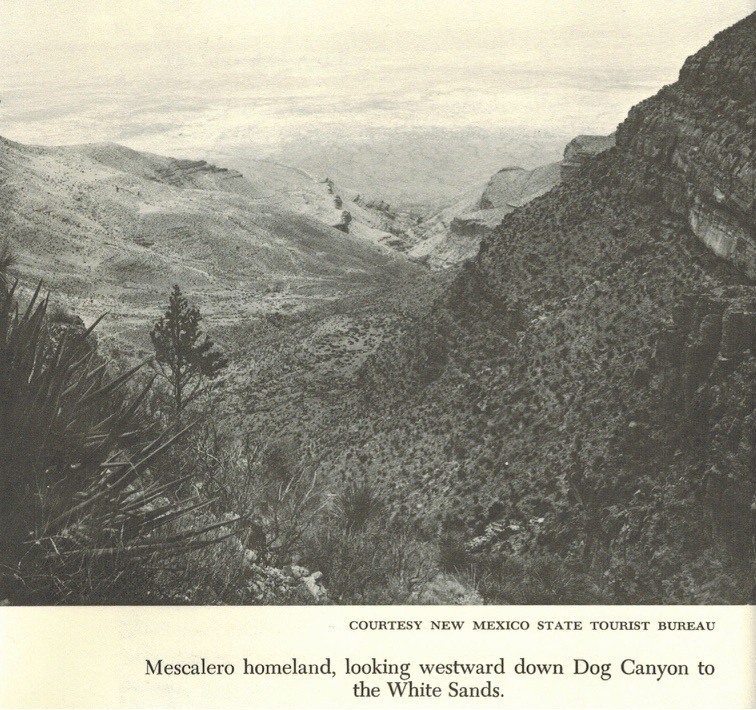 Although in a limited scope, Mescaleros were able to use food as leverage against the U.S., as Americans had done to them while pursuing them into Dog Canyon less than a year earlier. Mescaleros seized upon an opportunity to feed themselves in a way that closely aligned with their traditional lifestyle. While these occasional hunting parties only softened the captivity experience, they also reconnected the people to their culture and granted them some agency during the internment experience. Lawrence C Kelly, Navajo Roundup: Selected Correspondence of Kit Carson’s Expedition against the Navajo, 1863-1865 (Boulder, Colo.: Pruett Pub. Co., 1970), 11. Eve Ball, Nora Henn, and Lynda Sánchez, Indeh, an Apache Odyssey (Provo, Utah: Brigham Young University Press, 1980), 201. 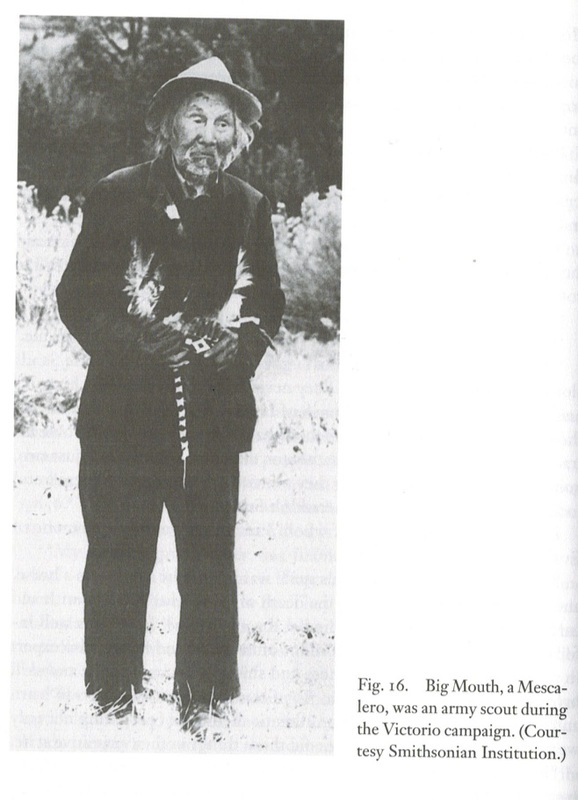 John Carey Cremony, Life among the Apaches (Lincoln: University of Nebraska Press, 1983), 201. Ball, Henn, and Sánchez, Indeh, an Apache Odyssey, 202. Cremony, Life among the Apaches, 203–205.